Congratulations to Carolyn Terry from the Montgomery County Association for Hearing Impaired Children. 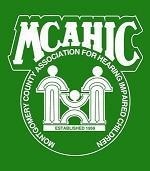 The MCAHIC serves almost 400 deaf and hard-of-hearing students (preK-12) enrolled in the Montgomery County Public School system in Montgomery County, Maryland, and their families. Most of the parents are not hearing impaired and now find themselves needing to learn ASL or Cued Speech in order to communicate with their child. The MCAHIC also provides funding for hearing aid ear molds for low-income and disadvantaged students, and scholarships for graduating high school seniors. They offer small grants to teachers and staff within the Montgomery County Public School (MCPS) system to attend professional development seminars, classes, and workshops on deaf or hard-of-hearing issues. “This coming school year, we are hosting our first post-high-school planning event that parents and students can attend to see the many different opportunities that are available for hearing-impaired individuals after graduation,” she says. The Montgomery County Public School (MCPS) system currently has 390+ students enrolled in deaf or hard-of-hearing programs. Some attend their neighborhood schools while a number of them attend a specific program housed in the Rockville High School cluster–Rock Creek Valley Elementary, Flower Valley Elementary, Lucy V. Barnsley Elementary School, Wood Middle School, and Rockville High School. All three of these schools are set up to handle the special needs of deaf and hard-of-hearing students, with everything from FM systems to ASL interpreters on staff to teachers specially trained in deaf education practices and programs. MCPS has itinerant teachers for the students who don’t attend the Rockville program, and even has 2 staff audiologists to help support the teachers and students. The MCPS Deaf and Hard of Hearing (D/HOH) support program is fairly unique in the country for the level of services that it offers. This entry was posted in Charity, Company News and tagged Moment Maker Grant. Bookmark the permalink.